Rian David Lindell (born January 20, 1977) is a former American football placekicker. He was signed by the Dallas Cowboys as an undrafted free agent in 2000. He played college football at Washington State where he was a part of Alpha Kappa Lambda fraternity. Lindell attended Pacific Junior High School (now Pacific Middle School) in Vancouver, Washington where he was coached by Mike Daltoso. He attended high school at Mountain View High School in Vancouver. At Washington State University, Lindell played as placekicker for the Cougars football team from 1996 to 1999. During his freshman and sophomore years, Lindell was on the same team with quarterback Ryan Leaf. Lindell played in the 1998 Rose Bowl at the end of his sophomore 1997 season. In the Rose Bowl, Washington State lost to a Michigan team that included future NFL players Brian Griese, Tom Brady (who was Griese's backup for the game) and Charles Woodson. Lindell was with the Seattle Seahawks for three seasons before joining the Buffalo Bills in 2003; Lindell replaced Mike Hollis, who was allowed to leave as a free agent. He was generally regarded as having a stronger but slightly less accurate leg than Hollis. In the 2006 season, Lindell converted 23 out of 25 field goal attempts, at 92%, tied for the league. On November 26, 2006, Lindell kicked the game winning field goal against the Jacksonville Jaguars to complete Buffalo's upset over Jacksonville. On November 11, 2007, Lindell kicked a game winning field goal to allow Buffalo to win 13-10 over the Miami Dolphins. On Sunday, December 2, 2007, Lindell kicked a game winning field goal against the Washington Redskins. Lindell was 5/5 in field goal attempts on that day. When kicking the game winning field goal, Lindell was "iced" twice by Washington head coach Joe Gibbs, which drew an unsportsmanlike conduct penalty against Washington, making the field goal 15 yards shorter. In week 3 of the 2008 season, Lindell had a game winning field goal on the final play of the game vs. the Oakland Raiders, which allowed Buffalo to move to 3-0. Later, in week 11 of the season, Lindell missed a 47-yard field goal with 38 seconds left. As a result, the Cleveland Browns ran the clock out to secure a 29-27 victory. On December 9, 2007, Rian Lindell set the record for the most consecutive field goals made in Buffalo Bills history. He had played in all 64 games for the Bills since 2003(until the middle of the 2011 season)and holds a Bills record with 83.04 field goal percentage. On November 29, 2009, Lindell successfully made a 56-yard field goal against rivals Miami Dolphins. This was not only Lindell's longest field goal of his career but also tied Houston Texans' kicker Kris Brown for longest successful field goal in the league for the 2009 season, until Sebastian Janikowski made a 61-yarder in week 17. On November 7, 2010 Lindell had an extra point blocked against the Chicago Bears, ending his streak at 321 successful extra points, an NFL record for most consecutive extra points to start a career. 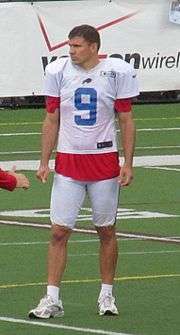 On September 25, 2011 Lindell booted two field goals against the Patriots, including a 28 yard game winner to give the Bills their first win in 15 games vs. the Patriots. On November 6, 2011 Lindell injured his shoulder while trying to trip up New York Jets running back Joe McKnight. He missed the remainder of the season. On February 7, 2012, the Bills announced that Lindell had agreed to a four-year contract for $10 million. On August 19, 2013, Lindell was released by the Buffalo Bills. On August 21, 2013, Lindell signed with the Tampa Bay Buccaneers. Lindell is married to his wife Johna. He is an avid fan of baseball’s St. Louis Cardinals. ↑ Wesseling, Chris (August 19, 2013). "Rian Lindell released by Buffalo Bills after 10 seasons". NFL.com. Retrieved August 19, 2013. ↑ Yasinskas, Pat (August 21, 2013). "Bucs sign kicker Rian Lindell". ESPN.com. Retrieved August 21, 2013.